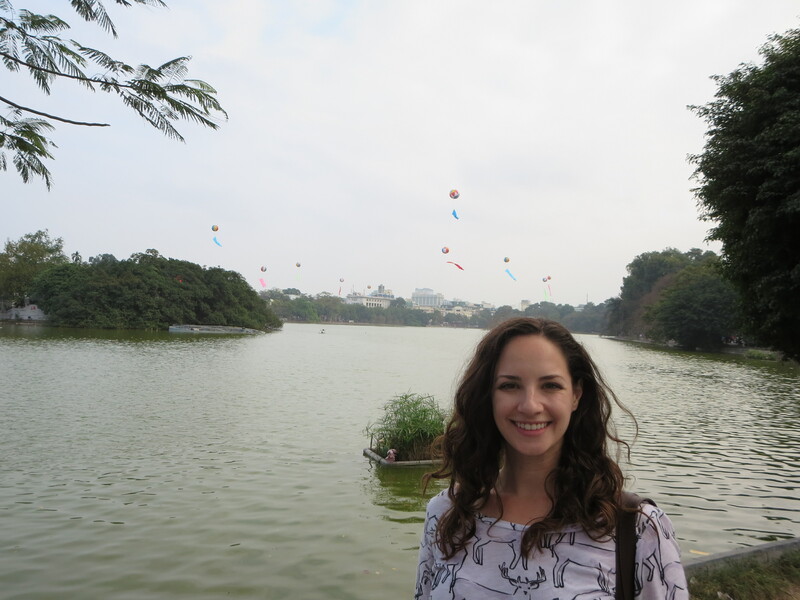 So I’m going to tell you about Hanoi today, but I need to share with you something very exciting first. This morning, I had a grapefruit. You’re probably disappointed in this so-called “exciting news,” but this is prime citrus season in New Orleans and last year, I ate more grapefruit, satsumas, and Meyer lemons than one person should consume (Spenser can attest to that). Consequently, I have been lamenting the fact that I cannot get my hands on any amazing southern citrus and that I must settle for…not as amazing citrus. However, a few days ago, I bought a suspicious looking orange at the grocery store (in was in a very small bin, next to the fruits that nobody buys) and lo and behold! It was a beautiful grapefruit. Between my renewed grapefruit adoration and the fact that I have no classes to teach on Fridays, today is already a very good day. Ok, now on to Hanoi! As you’ve probably guessed from my “Grapefruit Love Story,” yes we are finally back in China. Hanoi was our very last stop on our wonderful Spring Festival vacation and, although we were only there for about 30 hours, I was sad to leave. On our last day in Halong Bay, we made sure to leave bright and early so we’d have more time to explore Hanoi than we did when we first arrived (when we went to the kitten bar and then slept—not that exciting). 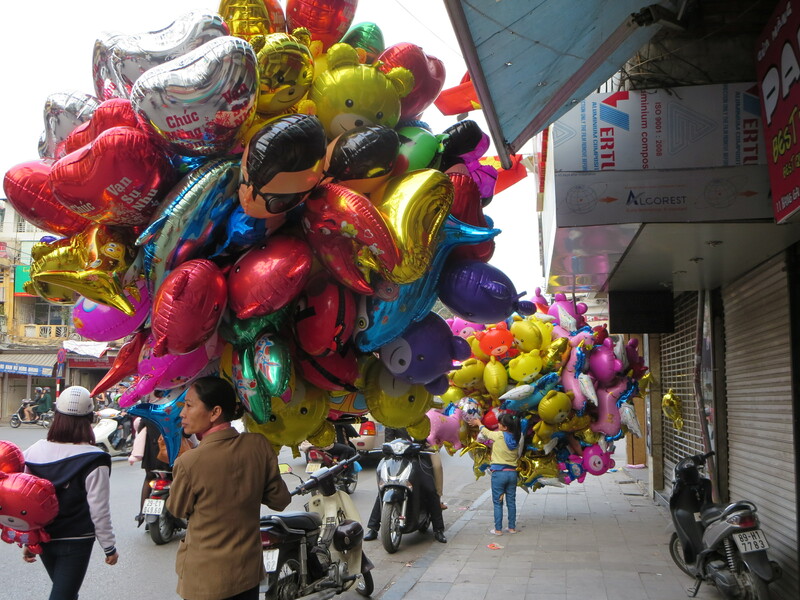 We got in to town around 3pm and, even though the Spring Festival was still being celebrated, the city was bustling! Shops and restaurants were open! People were on the streets! Things were happening! This was certainly a welcome sight after being isolated in Halong for the last three days. I wanted to steal all the balloons, but I refrained. As Spenser and I walked around the city, I kept having an odd feeling of deja-vu. I’ve never been to Hanoi, but it reminded me of somewhere I’d visited before: Baroque-influenced architecture, all of the buildings were around the same height, tree-lined sidewalks, motorbikes whizzing past, people dining and people watching in cafes, good food, crusty bread, etc. Hanoi is the capital of Vietnam, but it also served as the capital of French Indochina from 1902 to 1954. Ta-da! That’s where that deja-vu feeling came from. Hanoi (at least the Old Center) feels like a “Paris of the East.” I wasn’t expecting the French influence to still be so strong (especially because Vietnam is not too pleased with France (for good reason)), but I could see it everywhere. Add in Vietnamese culture and history and you’ve got yourself a very unique and beautiful city. 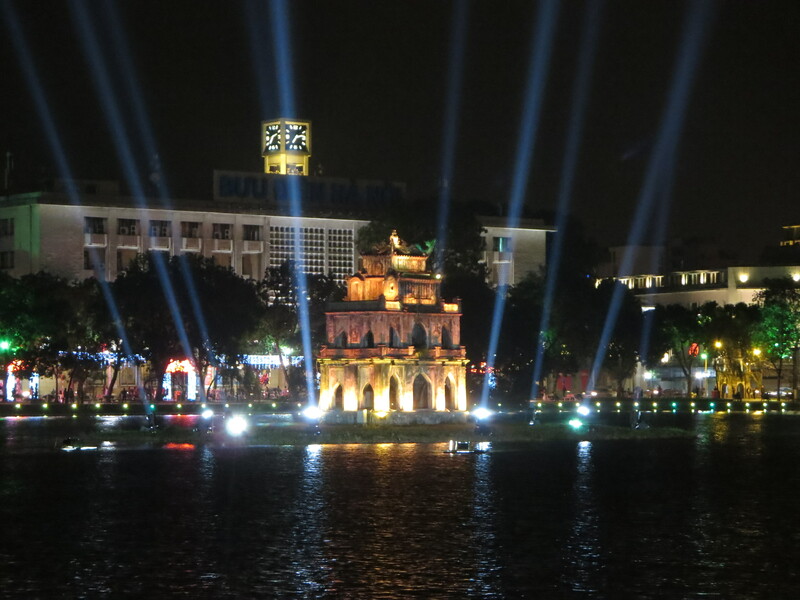 People everywhere were celebrating the Spring Festival and Hanoi went all out to show them a good time. Decorations, balloons, candies, lights! It was almost overwhelming after the quiet of Halong. We found a nice restaurant across from our hotel to snack on some spring rolls, then we took a long, nighttime walk around the lake. This guy looks like a bond villian. We had a lovely evening but, considering that this was our last destination on our three-week vacation, we were exhausted. We only had a few hours the next day before we headed to the airport, so Spenser and I decided we needed to treat ourselves. Spenser’s cousin Karolina recommended a restaurant called Café des Arts. It was scrumptious. After living off street food for the last three weeks, sitting down in a nice restaurant and having a glass of wine was a real treat. We started our lunch on their rooftop terrace overlooking a charming alley, but we had to move inside because of some rain. We didn’t mind one bit; the food was still fantastic. With heavy hearts, we left Hanoi and flew back to China. Although we were exhausted from our travels and looking forward to a return to “normalcy,” I really wish we had more time to spend in Vietnam. Our short stay there was definitely not long enough to really get to know the country and its people. I’m also disappointed that we didn’t have enough time (or strength, or money) to visit Ho Chi Minh city, but we’ll leave that for next time. And yes, there will definitely be a next time. Nice story!!!! Are satsumas tangerines? Mandarins? Their own special somethin’? Thought I knew food – this is a new one to me. They’re essentially mandarins, but New Orleanians (and probably many other southerners) call them satsumas. They’re very sweet and easy to peel, and they only start to rot once they’re off the tree, so you can keep them on there for months and just eat what you need! 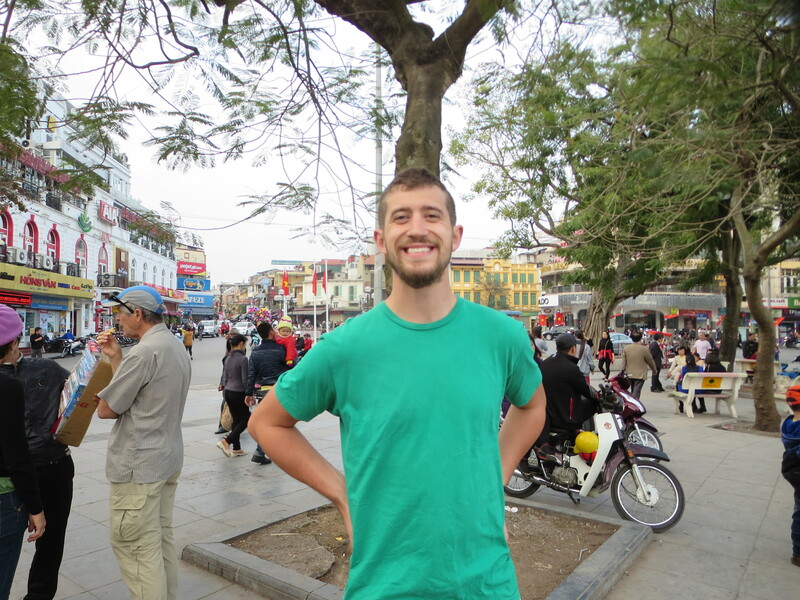 I wish I got to check out Hanoi when Sam and I were in Vietnam. It sounds amazing. Ho Chi Minh was cool too but super busy. Miss you both! I also love grapefruits. Love reading about your travels!!! !